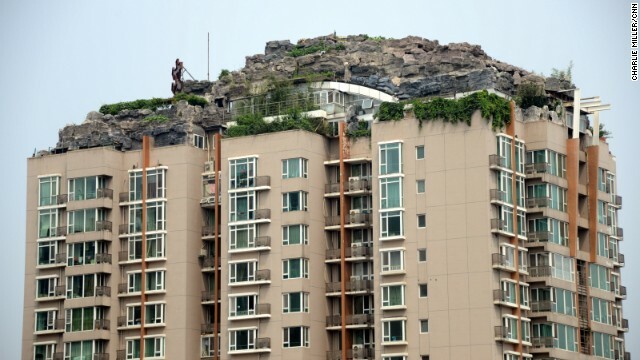 Chinese authorities have given a Beijing resident 15 days to tear down an artificial "mountain" he built illegally on top of a high-rise apartment block. Neighbors say workers hired by Zhang Biqing, the head of a traditional medicine company, built the 8,600-square-foot rock, tree, and bush-covered structure mostly at night, brushing aside their complaints that the additions were damaging the building's structural integrity. "He was very arrogant," one neighbor, who asked not to be named, told CNN. "He could care less about my complaints." Local urban management officials finally cracked down on the mountain after Chinese publications ran images of the structure on their front pages on Monday. Speaking to the Beijing Times the mountain's creator said he would comply with the order, but said that authorities were overreacting in categorizing his "ornamental garden" as a villa.